Not known from Michigan until 1991, when collected by A. A. Reznicek and M. R. Penskar in moist or wet prairie/savanna in Wayne Co. The next two years, discovered by them and by W. W. Brodowicz to be locally common in intermittent wet borrow pits, disturbed sandy soil, and prairie/oak savanna in both Monroe and Wayne Cos. This is a very distinctive much-branched, pubescent, little annual, with tiny bluish pink flowers on slender axillary pedicels. MICHIGAN FLORA ONLINE. A. A. Reznicek, E. G. Voss, & B. S. Walters. February 2011. University of Michigan. Web. 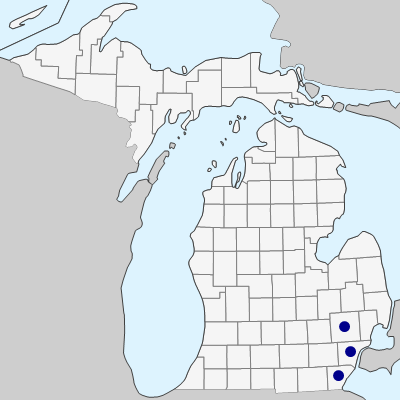 April 21, 2019. https://michiganflora.net/species.aspx?id=1949.